I kept looking, and that horn was waging war with the Saint’s and overpowering them. And when they shall have finished their testimony, the beast that ascended out of the bottomless pit shall make war against them, and shall overcome them, and kill them. Until the ancient of days came and judgement was passed in favour of the Saints of the Highest one, our God, and the time arrived when the Saint’s took possession of the kingdom. Choose for yourself today whom you will serve: whether the God’s which your fathers served, but as for me, and my generation we will serve the Lord. To choose today, to serve the gods, the religious systems our fathers served and bowed down to. And as for you, you shall make no covenant with the inhabitants of this land; you shall tear down their altars. But you have not obeyed me: What is this you have done? Wherefore I also said, I will not drive them out before you: But they shall become as thorns in your sides, and their gods shall be a snare to you. And there arose another generation after them who did not know the Lord, nor yet the work which He had done for Israel. Then the sons or Israel did evil in the sight of the Lord, and again turned to serve Baal. God created Adam and Eve to rule over all the earth. They were not created to be slaves to God, but to rule on His behalf over the other living things. God established the foundation: He himself was the First, and they were the second and third. And to keep it that way He established one prohibition - that they leave one selected tree alone. 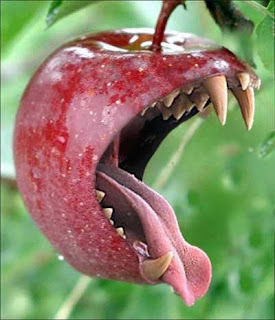 Adam and Eve were commanded not to touch it, or eat its fruit. The law God demanded, that the moment they did partake of the fruit, they would surely die. God was reminding that He was in charge, He alone was the Lord. The tree of the knowledge of good and evil was to be a constant reminder to them that although they had been given power and authority, they were still ruled by another. Their first step toward falling was forgetting their foundation. 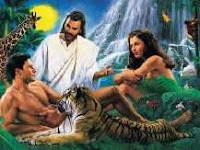 In the garden, Adam and Eve had no knowledge of evil. Under the protection of God, they were not vulnerable to the enemy. They knew only the goodness of God, so the temptation to take what God commanded and had, held no real allure. 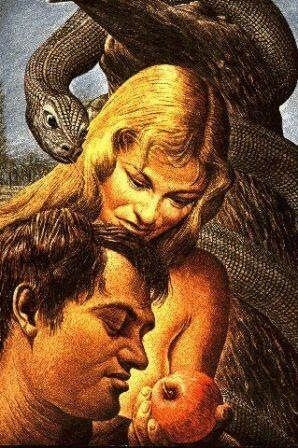 The serpent knew that all he could offer them was the knowledge of all he personally stood for, and was from the very beginning, a liar and a thief. The serpent could only offer the knowledge of good and evil, and the pain that came with suffering no longer protected by God, but now enslaved to the very nature of him, his death, and consequences. But he fooled them into disobeying God. They partook, bowed their knee to the tree of knowledge of good and evil. It had been totally forbidden by God. They had broken covenant and the test of the Lordship, or “the Firstness”, the foundation of their very existence, as God had given them this prohibition of not partaking of this tree, as a test to their obedience to the First Lordship. And Adam and Eve were not obedient and broke the first foundation. The masquerading of the serpent now continues down the ages. He who will distort and twist God’s own word and will. Rebellion pride and stubbornness are all aspects of witchcraft, and the burning of fire at the incense altar is the craft of man. 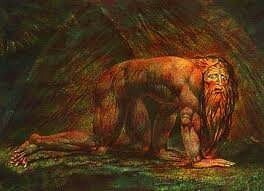 King David fell into the trap of the lust of the eyes and pride of life, and numbered the people to feel successful. And David's heart smote him after that he had numbered the people. And David said unto the LORD, I have sinned greatly in that I have done: and now, I beseech thee, O LORD, take away the iniquity of thy servant; for I have done very foolishly. For when David was up in the morning, the word of the LORD came unto the prophet Gad, David's seer, saying, Go and say unto David, Thus says the LORD, I offer thee three things; choose thee one of them, that I may do it unto thee. So Gad came to David, and told him, and said unto him, Shall seven years of famine come unto thee in thy land? Or wilt thou flee three months before thine enemies, while they pursue thee? Or that there be three days' pestilence in thy land? Now advise, and see what answer I shall return to him that sent me. And David said unto Gad, I am in a great strait: let us fall now into the hand of the LORD; for his mercies are great: and let me not fall into the hand of man. So the LORD sent a pestilence upon Israel from the morning even to the time appointed: and there died of the people from Dan even to Beersheba seventy thousand men. Thus David the son of Jesse reigned over all Israel. And the time that he reigned over Israel was forty years; seven years reigned he in Hebron, and thirty and three years reigned he in Jerusalem. And he died in a good old age, full of days, riches, and honour: and Solomon his son reigned in his stead. Now the acts of David the king, first and last, behold, they are written in the book of Samuel the seer, and in the book of Nathan the prophet, and in the book of Gad the seer, With all his reign and his might, and the times that went over him, and over Israel, and over all the kingdoms of the countries. Because of this sin, the judgement of God fell and 70,000 were killed by the pestilence. How could the plague be stopped? King David had to build an altar to the Lord. An intercession, an incense altar of burning coals to stop the plague. 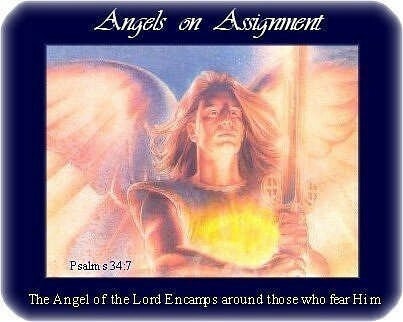 Praise ye him, all his angels: praise ye him, all his hosts. Praise ye him, sun and moon: praise him, all ye stars of light. Praise him, ye heavens of heavens, and ye waters that be above the heavens. Let them praise the name of the LORD: for he commanded, and they were created. Lucifer, who had masqueraded as the serpent had been the first to rebel against God. Isaiah tells us that he fell into pride and rebellion against God. 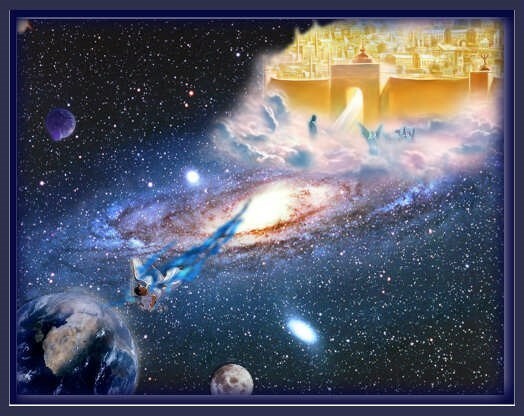 Isaiah says ‘I will exalt my throne above the stars of God (and) … I will be like the most high. Lucifer was so full of himself that he left no room for God. "Lucifer was so full of himself that he left no room for God"
And he said unto them, I Beheld Satan al lightning fall from heaven. He was like one covered in brilliant jewels. He reflected the Glory of God as he worshipped Him. He reflected the Glory of God as he worshipped Him. Lucifer’s first mistake was to believe that he himself was beautiful. He failed to realise that he was only beautiful when he was reflecting the Glory of God. Every word of God is tested. He is a shield to those who take refuge in Him. Do not add to His words, lest he reprove you, and you be proved a liar. 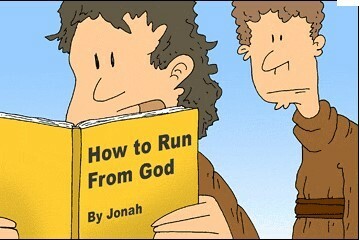 For the LORD giveth wisdom: out of his mouth cometh knowledge and understanding. Then shalt thou understand righteousness, and judgment, and equity; yea, every good path. But the prince of the kingdom of Persia withstood me one and twenty days: but, lo, Michael, one of the chief princes, came to help me; and I remained there with the kings of Persia. Now I am come to make thee understand what shall befall thy people in the latter days: for yet the vision is for many days. And when he had spoken such words unto me, I set my face toward the ground, and I became dumb. And, behold, one like the similitude of the sons of men touched my lips: then I opened my mouth, and spake, and said unto him that stood before me, O my lord, by the vision my sorrows are turned upon me, and I have retained no strength. For how can the servant of this my lord talk with this my lord? For as for me, straightway there remained no strength in me, neither is there breath left in me. Then there came again and touched me one like the appearance of a man, and he strengthened me, And said, O man greatly beloved, fear not: peace be unto thee, be strong, yea, be strong. And when he had spoken unto me, I was strengthened, and said, Let my lord speak; for thou hast strengthened me. Then said he, Knows thou wherefore I come unto thee? And now will I return to fight with the prince of Persia: and when I am gone forth, lo, the prince of Grecia shall come. But I will shew thee that which is noted in the scripture of truth: and there is none that holds with me in these things, but Michael your prince. Michael means “Who is like God”. Michael, He is like the Royal Ambassador of the Highest Order of God. He guards the throne room. 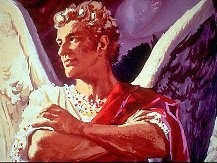 Michael the Archangel in the book of Daniel and Revelations is not the Michael of Rome. Michael the Archangel led the army of God to war against Satan (Revelation 12:7-9). 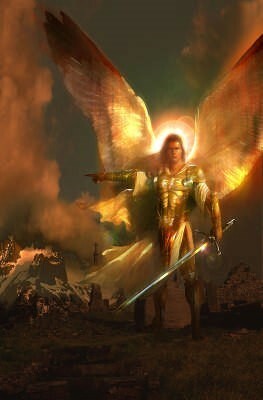 Michael the Archangel is a warrior/king, and God sent Michael to fight in the Book of Daniel. He is the grim reaper, the angel of death. First applies, implies to the beginning of foundational principles. The first: God’s law of first things. It is impossible for anyone or anything to replace God as the First, The Beginning, The Alpha. 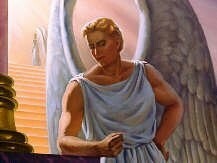 Lucifer failed to realise that he was only beautiful because he reflected the Glory of God. His own self-centredness and pride blinded him to the fact that he could never be greater than the Lord God himself. So Lucifer’s rebellion became his literal downfall. 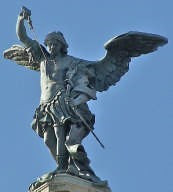 In response to Lucifer’s rebellion and challenge to the Lordship, God commanded Michael the Archangel to cast him out of heaven, away from God’s Glory and presence. And also all other angels that had anything to do with Lucifer. And there was war in heaven: Michael and his angels fought against the dragon; and the dragon fought and his angels, And prevailed not; neither was their place found any more in heaven. And the great dragon was cast out, that old serpent, called the Devil, and Satan, which deceived the whole world: he was cast out into the earth, and his angels were cast out with him. There is always a contending for God’s throne, His place, His sovereignty, and Lucifer tried to become a pretender of God’s throne after the fall of Adam and Eve. Sadly it will not be the last attempt. It is impossible for us or any created being to exalt ourselves to the place of the Lordship of God. It does not work - it will fail. Even though we may try to exalt ourselves to this place in our own lives, but we may not be aware of it. Although this is the same spirit of independency that caused Lucifer, the fallen angel, to lose his place in heaven. The office of Lordship and the exalted position of the throne were created for the one and only true Holy God. Lucifer proclaimed “I will exalt my throne above the stars of God and I will be like the most High”. The moment this is said and the “I” comes first in our lives, trouble will follow. A curse came upon Adam and Eve because they neglected to put God and His commands first. Adam broke the Covenant with God. The woman saw that the tree of knowledge of good and evil would make her wise. Wise to the occult, wise to tapping into all sorts of occult practices, mediums, new age, witchcraft, consulting the dead, mystics, and astrology etc. And here is the beginning of the first breaking of God’s law and the beginning of the unfolding of the mystery of iniquity. The tapestry of evil being woven. The establishment of the kingdom of darkness and the worship of false gods. The partaking of the tree of knowledge, the Illuminati, and conspiracy of evil plans. 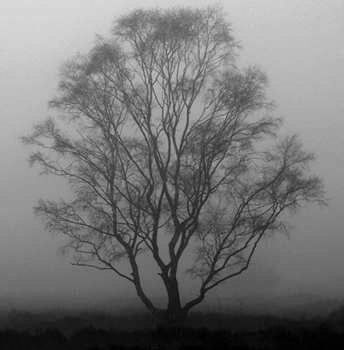 This tree represents the nature of Satan. It is a container of psychic power and soul power that is operating in the church today unknowingly. It is not only dangerous but deadly. 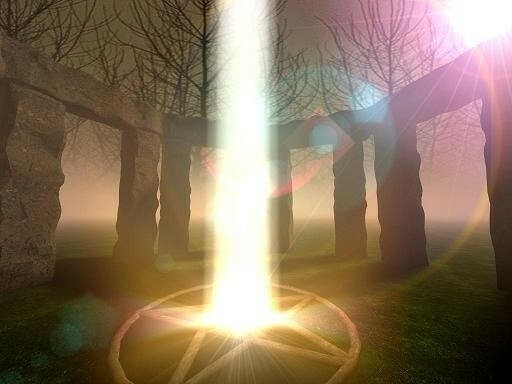 Psychic power and soul power is witchcraft and control of the kingdom of man and darkness. The body and blood of the sacrificed lamb, victim, was presented to the Lord as a substitute for the sin of Israel. Spiritually, the brazen altar is the cross of Calvary. Jesus Christ, God’s perfect Lamb, poured out free willingly His precious blood upon the Cross, as a substitute offering for our sin. Through His body and blood we can walk free from the law of sin and death. 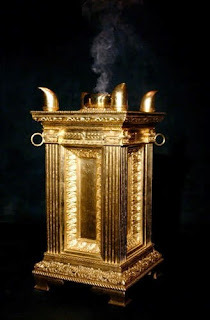 In many degrees of Freemasonry, make use of the brazen altar, with oaths and rituals of occult blood sacrifices made over many parts of the body. 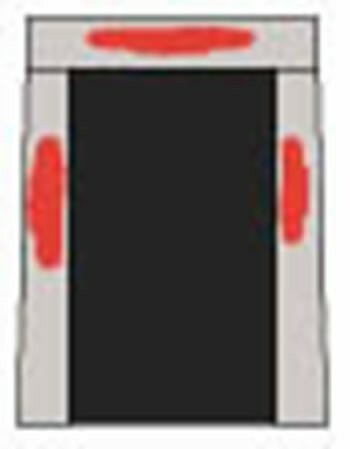 An example: The Master Mason – third degree. Like Hiram Abiff, becomes a blood sacrifice. He is prepared to die for the building of the Masonic temple – a false messiah. Christ came, to lay down His life and pour out His blood, as an offer for all of us. Another example: The Mason of the Seventeenth degree sheds his own blood as a sin offering for the false temple. 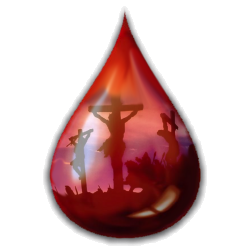 Here the blood of man is shed to take over the power of the blood of Jesus. And I said unto him, Sir, Thou know. And he said to me, These are they which came out of great tribulation, and have washed their robes, and made them white in the Blood of the Lamb. And thou shalt say unto Pharaoh, Thus says the LORD, Israel is my son, even my firstborn: And I say unto thee, Let my son go, that he may serve me: and if thou refuse to let him go, behold, I will slay thy son, even thy firstborn. When Israel was a child, then I loved him, and called my son out of Egypt. 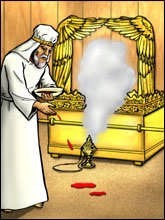 As they called them, so they went from them: they sacrificed unto Baalim, and burned incense to graven images. Here God was establishing a precedent when he instructed Moses to tell Pharaoh to let his firstborn go, so that the firstborn my serve Him. God considered Israel his firstborn because they were descendants of Isaac, the firstborn son of Abraham, whom God promised to make a Holy nation, a Holy priesthood unto Himself. God was fulfilling His law of first things, foundational truths by delivering His firstborn. Pharaoh did not respond positively. He refused to let God’s people go, so in response to Pharaoh’s defiance to God’s own command, God began to unleash plagues against the Egyptians which became progressively more severe. And the LORD said unto Moses, Pharaoh's heart is hardened, he refused to let the people go. And the LORD spake unto Moses, Say unto Aaron, Take thy rod, and stretch out thine hand upon the waters of Egypt, upon their streams, upon their rivers, and upon their ponds, and upon all their pools of water, that they may become blood; and that there may be blood throughout all the land of Egypt, both in vessels of wood, and in vessels of stone. First, water turned to blood, than came the plagues of frogs, gnats, flies and the death of livestock. And hail left the countryside in ruins to be eaten by locusts. The Lord God, allowed the plagues to be upon the Egyptians to break Pharaoh’s stubborn will and to demonstrate His power and superiority over these pagan gods of Egypt. Then a creeping darkness spread over the land, covering everything for three days. The Israelites, however, were spared and had lights in the places where they lived. 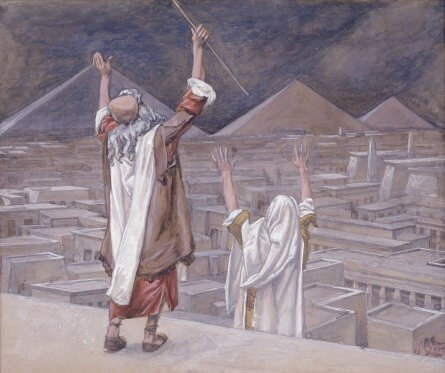 And Moses said, Thus says the LORD, About midnight will I go out into the midst of Egypt: And all the firstborn in the land of Egypt shall die, from the firstborn of Pharaoh that sits upon his throne, even unto the firstborn of the maidservant that is behind the mill; and all the firstborn of beasts. And there shall be a great cry throughout all the land of Egypt, such as there was none like it, nor shall be like it any more. But against any of the children of Israel shall not a dog move his tongue, against man or beast: that ye may know how that the LORD doth put a difference between the Egyptians and Israel. Then came the tenth plague. 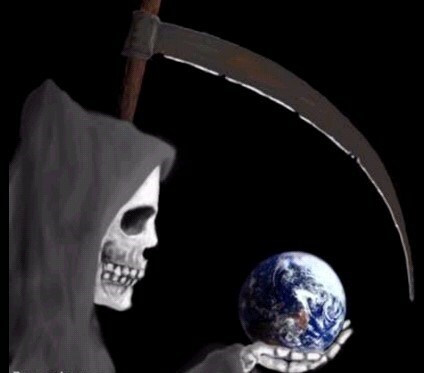 The tenth plague was the death of the firstborn. Every first born son, even the firstborn male of cattle, died during the night. This was what Moses had predicted in the beginning. Here is God’s mercy seen. Maybe we can break manmade laws, but we can’t break God’s laws. We don’t ever really break His laws, we violate them, and then pay the consequences. The seven plagues of those in covenant with the beast, Babylon, Rome, Freemasonry, Egypt, and the occult. The first angel left the temple and poured out his flask over the earth. And horrible, malignant sores broke out on everyone who had the mark of the creature and was worshipping his statue. 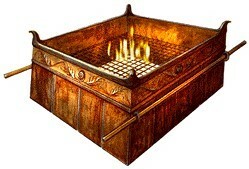 The gold lid to the Ark of the Covenant where God promised to meet with His People was the mercy seat. Once a year the high priest of Israel sprinkled the blood of atonement on this cover. Christ himself is called our mercy seat or propitiation. Jesus was not only the Lamb, He also became the High Priest. This was the only way to accomplish the impossible. Jesus, fully God and fully man, would reconcile God and man by covering sin with His own blood. "There is no room for Jesus"
This matter is by the decree of the watchers, and the demand by the word of the holy ones: to the intent that the living may know that the most High ruled in the kingdom of men, and giveth it to whomsoever he will, and setteth up over it the basest of men. 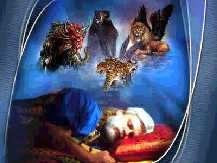 This dream I king Nebuchadnezzar have seen. Now thou, O Belteshazzar, declare the interpretation thereof, forasmuch as all the wise men of my kingdom are not able to make known unto me the interpretation: but thou art able; for the spirit of the holy gods is in thee. Then Daniel, whose name was Belteshazzar, was atoned for one hour, and his thoughts troubled him. The king spake, and said, Belteshazzar, let not the dream, or the interpretation thereof, trouble thee. Belteshazzar answered and said, My lord, the dream be to them that hate thee, and the interpretation thereof to thine enemies. The tree that thou sawest, which grew, and was strong, whose height reached unto the heaven, and the sight thereof to all the earth; Whose leaves were fair, and the fruit thereof much, and in it was meat for all; under which the beasts of the field dwelt, and upon whose branches the fowls of the heaven had their habitation: It is thou, O king, that art grown and become strong: for thy greatness is grown, and reacheth unto heaven, and thy dominion to the end of the earth. And whereas the king saw a watcher and an holy one coming down from heaven, and saying, Hew the tree down, and destroy it; yet leave the stump of the roots thereof in the earth, even with a band of iron and brass, in the tender grass of the field; and let it be wet with the dew of heaven, and let his portion be with the beasts of the field, till seven times pass over him; This is the interpretation, O king, and this is the decree of the most High, which is come upon my lord the king: That they shall drive thee from men, and thy dwelling shall be with the beasts of the field, and they shall make thee to eat grass as oxen, and they shall wet thee with the dew of heaven, and seven times shall pass over thee, till thou know That the most High ruled in the kingdom of men, and giveth it to whom soever he will. And he said unto them, I am a Hebrew; and I fear the LORD, the God of heaven, which hath made these and the dry land. Then were the men exceedingly afraid, and said unto him. Why hast thou done this? For the men knew that he fled from the presence of the LORD, because he had told them. Then said they unto him, what shall we do unto thee, that the sea may be calm unto us? For the sea wrought, and was tempestuous. In all these institutions there is no room for Jesus. In Freemasonry – The Blue Lodge – the inner sanctuary. There is no room for Jesus. The name of Jesus Christ, the Bright and Morning Star, is struck out of all scripture and doctrines. The star they worship is not Jesus – the bright and morning star. 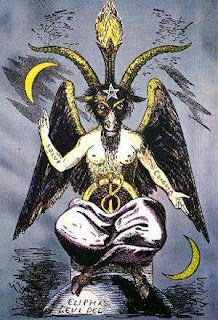 Their worship is the star of the goat god Mendez. He is the god of lusts – lusting after power, God’s throne. It is time, church, to repent of the occult blood covenants of our ancestors. Our covenant with the Lamb of God will remain broken by occult and freemasonry covenants in our family line. 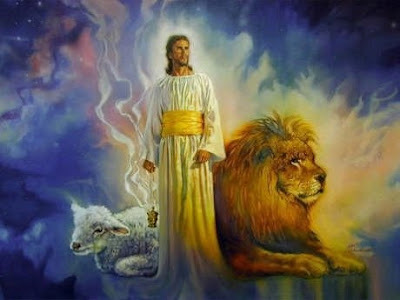 Jesus is the Lamb of God who came as God’s Passover lamb. Jesus came to fulfil the law, Jesus being both the Lamb but also the High Priest, poured out his Blood freely so that we could be free of the law of sin and death. Of being covenanted with death. 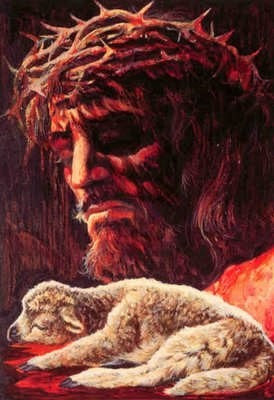 Jesus the clean spotless Lamb, the first born, redeemed humanity, the unclean. Jesus died once for all, and when the destroyer, the angel of death, sees the Blood of Jesus applied to our lives, he must pass over.